Overview - Before he became a sensation with the twisty revenge story Memento, Christopher Nolan fashioned this low-budget, black-and-white, 16 mm neonoir with comparable precision and cunning. Supplying irrefutable evidence of Nolan’s directorial bravura, Following is the fragmented tale of an unemployed young writer who trails strangers through London, hoping that they will provide inspiration for his first novel. He gets more than he bargained for with one of his unwitting subjects, who leads him down a dark, criminal path. With gritty aesthetics and a made-on-the-fly vibe (many shots were simply stolen on the streets, unbeknownst to passersby), Following is a mind-bending psychological journey that shows the remarkable beginnings of one of today’s most acclaimed filmmakers. In reality, most human beings are merely strangers. Anonymous faces in a vast sea of nameless masses, the majority go about their days paying little attention to those around them. Others, however, watch. They watch and learn. But just how much can someone glean from studying a person's daily interactions? From invading the space they live in? From perusing their most intimate possessions? Through perception alone, some are able to read people like a book, filling in full histories and personalities. In Christopher 'Dark Knight' Nolan's debut feature film, 'Following,' the director examines two such individuals. One watches out of a desire for inspiration, and the other -- well, his intentions might be more sinister. A smart, winding thriller focused on observation, behavior, and manipulation, the low-budget noir remains one of the celebrated director's best movies, proving that great filmmakers can always make the most out of very little. Lonely and listless, an aspiring writer (Jeremy Theobald) turns to watching strangers in his free time. Seeking inspiration, he begins to follow random individuals, hoping that their lives might spark an idea for a book. When one of the writer's subjects, Cobb (Alex Haw), discovers that he's being shadowed, he confronts his clandestine admirer. Instead of being angry, it turns out that Cobb is something of a people watcher himself, but his methods aren't quite so innocuous. As the two develop a friendship, the young writer is thrust into a world of crime -- and the once distant observer is forced to become an active participant in his own twisting web of danger and deceit. Strongly anticipating the director's follow-up film, 'Memento,' the story is told in a nonlinear fashion, weaving parallel narratives together from different points in the plot. Key visual markers like our protagonist's haircut, clothing, and even bruises clue us into where the scene fits into the developing mystery, providing contextual cohesion to the potentially confusing presentation. Despite the break from sequential scripting, the narrative is actually extremely taut and impeccably structured. Rather than a jumbled collection of disparate scenes, the film is instead specifically tailored toward its nonlinear progression. Various setups, payoffs, and reveals are all crafted to work within the deliberately shuffled order of events, often placing previous scenes in an entirely new light. The numerous twists and turns keep the audience on their toes, constantly forcing the viewer to reassemble the disjointed pieces as they unfold. More than a gimmick, the ultimate success or failure of the film rests on the effectiveness of this irregular framework -- and thankfully, Nolan weaves the displaced sequences together with just the right mixture of meticulous precision and wayward ambiguity. Beyond its nonlinear presentation, the film's story offers an intelligent, noir influenced thriller steeped in shadowy deception. Concepts dealing with loneliness, voyeurism, identity, and manipulation fuel the runtime, and Nolan does a great job of delving into the deeper psychology of his themes. The motivations behind the characters' people watching and crimes leads to some thought provoking insights into society, behavior, and human interaction. Backstabbing, exploitation, and murder all creep into the proceedings as well, resulting in a genuinely smart and engaging cerebral mystery. With that said, there are some minor flaws in the execution. The film's ultimate reveal presents a rather elaborate scheme, and some later scenes feature a bit too much exposition. Of course, these are all staples of the genre, and despite some minor nitpicks, the plot twists hold up fairly well under scrutiny. The death knell for many micro-budget debuts is often found in extremely poor performances. Fortunately, 'Following' completely avoids this pitfall. While some of the acting can be a little rough around the edges, overall the leads are very strong in their roles -- so much so that I'm quite surprised that they haven't gone on to star in more films. As the nameless aspiring writer who serves as the movie's protagonist, Jeremy Theobald crafts an interesting persona. He carries the picture well, and imbues the role with a troubled sense of angst and isolation. Alex Haw is also memorable as the cunning thief Cobb. Charming and calculating, he presents a slightly skewed variation of Theobald's character. While the writer only wants to observe strangers for inspiration (at least, initially), Cobb takes it a step further and steals from his victims, turning crime into a kind of social experiment. Together the two actors offer an interesting contrast, revealing two different sides to the script's psychological coin. Embracing the film's minuscule budget, Nolan actually gears the screenplay toward his economic limitations, using potential restrictions to his benefit. 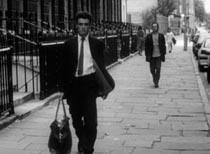 As such, the movie is shot in black and white and uses a predominantly fly-on-the-wall, documentary style. The often shaky, handheld aesthetic works perfectly with the gritty, voyeuristic story. Instead of revealing the film's monetary confines, the stripped-down visuals work as a deliberate artistic choice, evoking the moody, paranoid air of the plot. In fact, this is one of those rare indie efforts that partially succeeds because of its comparatively low production values. Any more polish would only diminish the raw style on display. Though fittingly rough, the director's approach is also surprisingly assured, displaying extraordinary control over tone and pacing. Nolan's great potential is clear from the opening shot, and like 'Blood Simple,' 'Eraserhead,' and 'Shallow Grave,' the film serves as a commanding introduction to a lasting cinematic voice. With the recent release of 'The Dark Knight Rises,' December offers film fans a rather fascinating dichotomy, placing Nolan's debut feature right beside his latest effort. On the one hand, we have an independent, micro-budget, black and white, documentary style thriller shot on weekends with the help of friends and family. On the other hand, we have a studio produced blockbuster partially shot with IMAX cameras that's filled with expensive actions scenes, CG wizardry, and massive explosions. Side by side, they represent complete opposite ends of the moviemaking spectrum -- and yet, shades of both films trickle into the other. Throughout 'Following,' Nolan demonstrates the potential skill, vision, and proficiency capable of tackling large scale projects, and throughout 'The Dark Knight Rises,' one can still see little hints of that young indie filmmaker fascinated by internal anguish and noir mysteries. Numerous stylistic and narrative trademarks found in the director's blockbusters can all be traced back to his humble filmmaking origins. In some ways, the production of 'Following' serves as the 'Batman Begins' story of the director's career -- a sort of "Nolan Begins," if you will. While I'm a fan of all the filmmaker's studio efforts, I can't help but be enamored by the more stripped-down approach present here, and despite all of his later works' epic bravado, I think that 'Following' is actually one of his best films. An intelligent, paranoid thriller, the movie offers a potent and taut exercise in nonlinear storytelling, and remains a striking example of finely crafted independent cinema. Criterion presents 'Following' in their standard clear case with spine number 638. The BD-50 Region A disc comes packaged with a pamphlet featuring an essay by film programmer and critic Scott Foundas. The film is provided with a black and white 1080p/AVC MPEG-4 transfer in the 1.33:1 aspect ratio. Seemingly authentic and free of any unnecessary manipulation, the video retains all of the cinematography's gritty texture. The source print is in good shape, but there are some minor specks, vertical lines, scratches, and hairs visible in a few shots. A heavy layer of grain is present throughout, giving the image a rough but pleasingly filmic appearance. Despite being shot on 16 mm, the image actually displays a strong sense of detail and depth with unexpectedly sharp clarity. The low budget realities of the production are still clear, but the gritty aesthetic works wonderfully with the voyeuristic, noir style. Contrast is high with bright whites, deep blacks, and a steady grayscale. Though shot over several weekends on a shoe-string budget, 'Following' comes to Blu-ray with a surprisingly strong transfer. The image isn't impressive by traditional standards, but the grungy, grainy, stripped-down style is perfectly preserved. The audio is presented in an English LPCM mono track and a remixed English DTS-HD MA 5.1 variation. Optional English subtitles are also included. The disc defaults to the surround sound remix, and the track offers a sizeable improvement that enhances and cleans up the film's low budget audio recordings while still remaining respectful to the original sound design. Dialogue is clean and relatively full-bodied throughout. With that said, there are a few instances where speech is slightly overpowered by background effects. The film's tense score booms from the speakers with crisp fidelity, solid separation, and some decent low frequency activity. Despite being a 5.1 remix, the sound design itself remains faithful to the movie's modest roots, resisting overproduced and aggressive flourishes. Instead, surround use is fairly subdued and is relegated to music cues and faint ambiance. Effects work is nicely spread across the front soundstage with appropriate directionality that adds a subtle sense of space and atmosphere. For those opposed to remixes, the original mono track is also provided, and while it gets the job done just fine, the film's low budget is much more apparent. The track is noticeably thinner and flatter than the remix, and speech, music, and effects all feature a tiny, strained quality. Likewise, background hissing, static, and camera noise are occasionally audible throughout. Instances where dialogue gets swallowed up by ambient sounds are also more prominent. Though not ideal, these flaws are of course all understandable given the nature of the recordings, and thankfully the audio is still very listenable. With both the original mono track and a new, very respectful 5.1 remix, Criterion has provided audio options for all tastes. While one can't go wrong with either, in this case I recommend the surround sound track. It offers a noticeably richer and dynamic presentation that cleans up many of the flaws and inconsistencies found in the original low budget mono recordings. The sound design is still relatively modest and stripped down, but it all remains faithful to the filmmakers' intentions. Criterion has put together an excellent collection of supplements, including a commentary, interview, short film, and even a chronological cut of the movie. The extras are presented in 1080p with Dolby Digital audio and no subtitles (unless noted otherwise). Audio Commentary with Christopher Nolan - Recorded in 2001, this is a solid commentary from the director. Nolan provides a steady stream of details related to the film's production, and how he geared the project toward the movie's miniscule budget. Characters, locations, and story inspirations are also addressed, along with insights into the film's nonlinear structure. While the track can be a little dry, Nolan offers an informative and very worthwhile discussion. Christopher Nolan (HD, 26 min) - This is a comprehensive and at times fascinating interview with director Christopher Nolan. While some information is repeated from the commentary, most of the insights are new, providing a thorough discussion that largely focuses on working within the film's low budget. Nolan elaborates on the economical shooting style, sound work, noir visuals, and how he tailored the film's story and scope toward his monetary limitations. Filled with tons of technical details and enlightening observations about filmmaking, this is a great interview that should make an especially stimulating watch to budding independent directors. The Linear Edit (HD, 1 hr & 10 min) - Presented with LPCM 1.0 sound, this is a chronological edit of the film. While this cut is an interesting novelty, the story really is designed to work in a nonlinear order, so placing the scenes in sequence mitigates many of the carefully planned reveals and twists. Script to Film (HD, 10 min) - Three scenes from the movie are played back alongside the original script pages, revealing just how much or how little was changed from the screenplay. Doodlebug (HD, 3 min) - Presented in upscaled 1080i, this is an odd and amusing short film directed by Christopher Nolan that features a man chasing a very unusual bug. Trailers (HD) - The film's theatrical (1 min) and rerelease (1 min) trailers are included in upscaled 1080i. 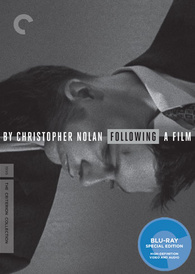 The striking debut film from Christopher Nolan, 'Following' is an intelligent and gritty examination of identity, deception, human behavior, and manipulation. Its gritty aesthetic works perfectly with the noir influenced story, and the nonlinear plotting presents an intricately designed jigsaw puzzle for audiences to decipher. Despite the film's low budget, the video transfer is surprisingly strong. The original mono track reveals many of the production's inherent limitations, but the respectful 5.1 remix offers a great audio presentation. The supplements are all very informative, especially for budding independent filmmakers. This is a great movie and a great disc from Criterion. Highly Recommended.